To help you stay ahead of the growing throughput and limited space challenges of the data center, LightWave offers the new High-Density OM4 Quad LC to MTP Fiber Cassette to help you meet these challenges with a fast, easy and compact solution that takes advantage of the best fiber optics technology on the market. 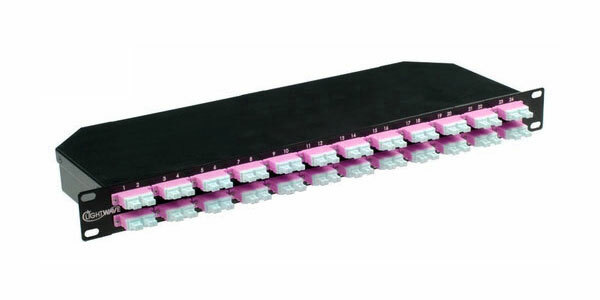 Available in Multimode 50/125 OM4 fiber optics, this high density cassette is a fiber adapter panel with preterminated and pre‐tested fiber harnesses already loaded in the cassette. The cassette is configured with 24 front-mounted Quad LC adapters. Choose your rear-mounted MTP brand connection from a selection of configurations, including 8 connectors at 12 fibers each, 4x24-fibers, or the most space efficient configuration of 2x48-fibers. By plugging an MTP brand cable into the back, 12 connections are lit up. 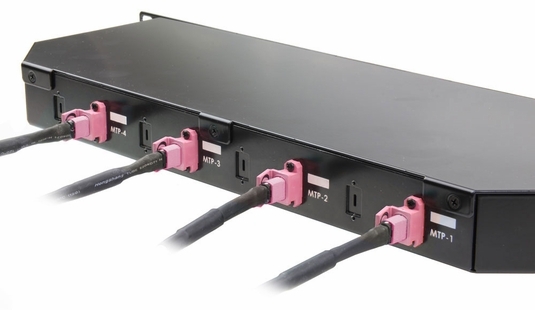 With this high-density cassette, you can achieve up to 96 connections using all MTP brand inputs and the quad LC ports in the front. These 1RU cassetes can be mounted horizontally or vertically with available adapter rack brackets. * Expect max IL in the 1.1dB range for the 48F and 72F MM products – the precision in the ferrule is almost the same as 24F, but again, getting physical contact on all fibers across multiple rows is highly improbable.